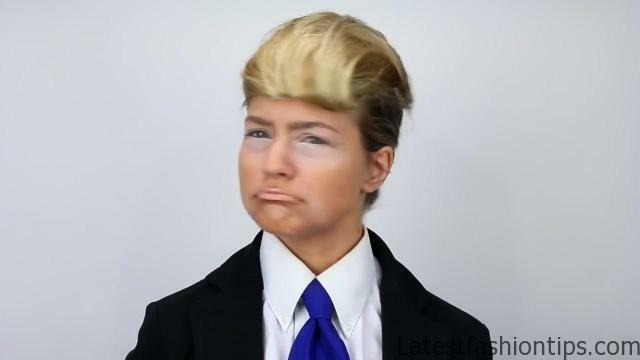 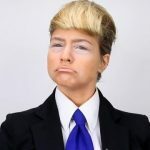 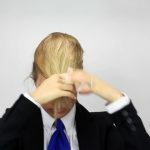 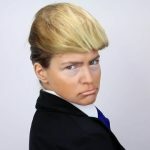 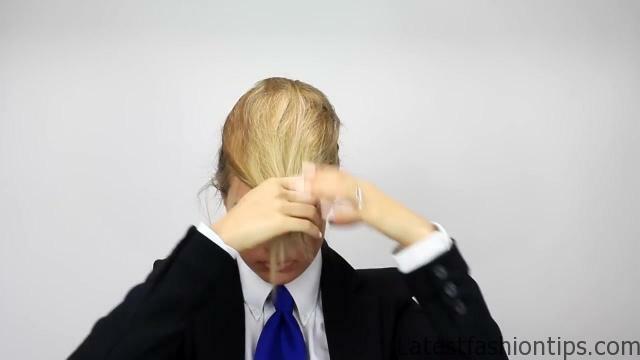 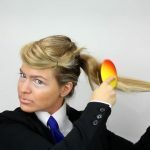 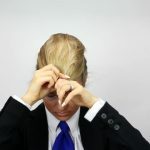 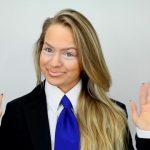 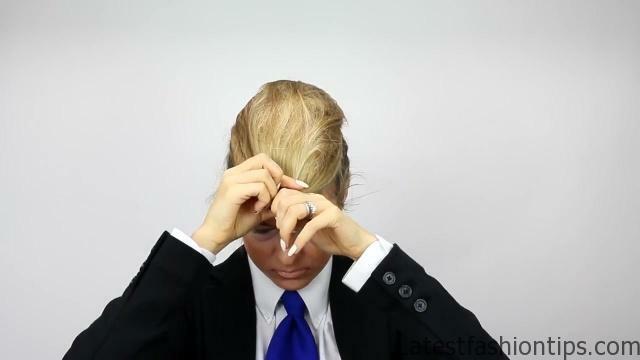 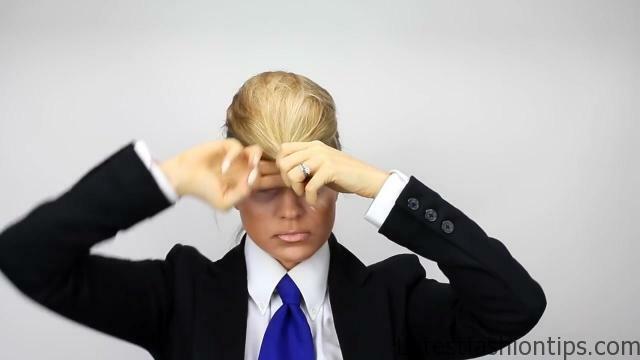 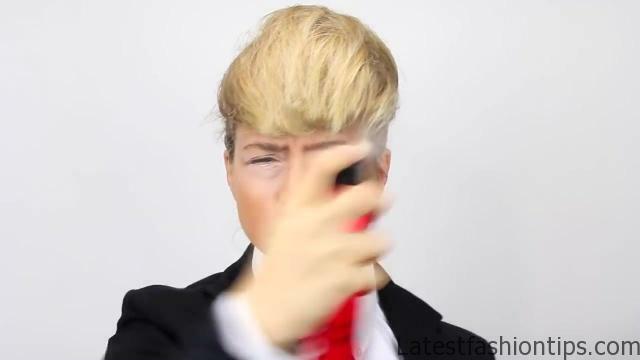 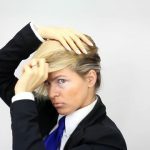 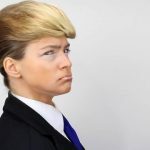 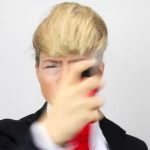 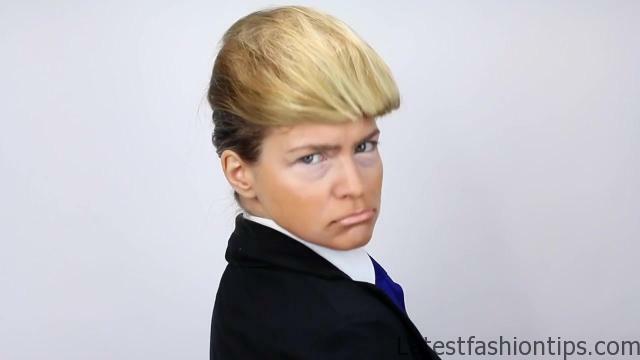 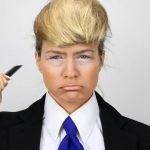 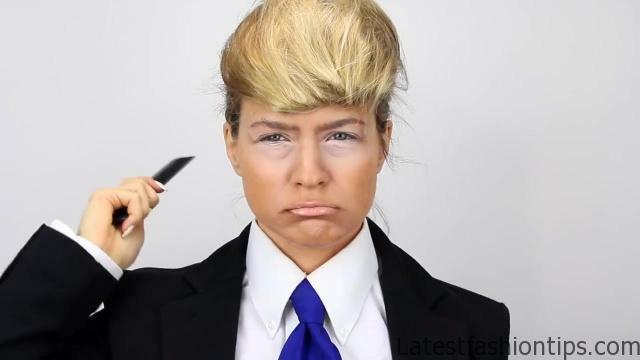 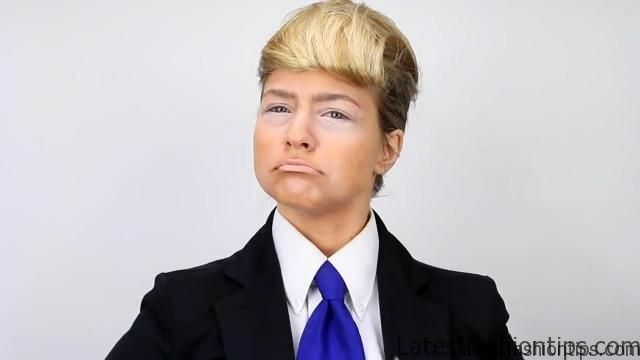 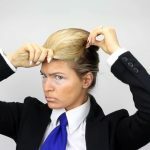 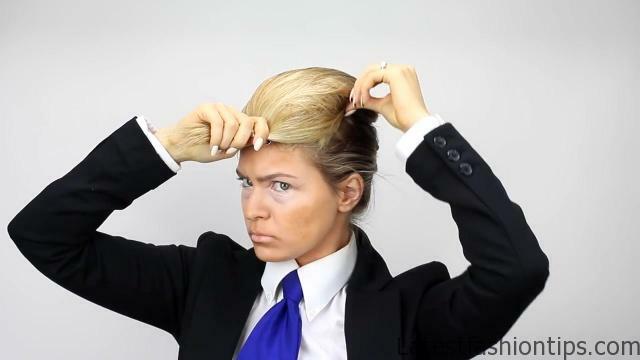 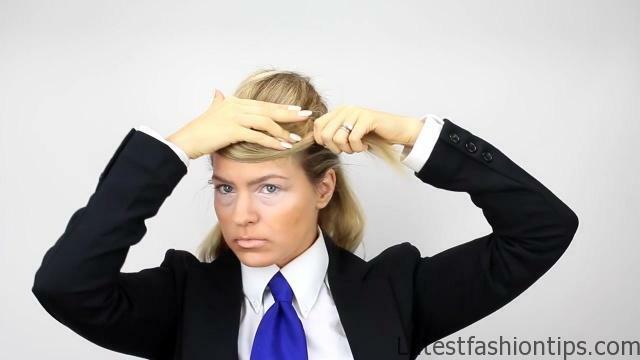 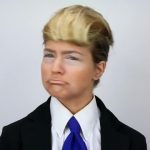 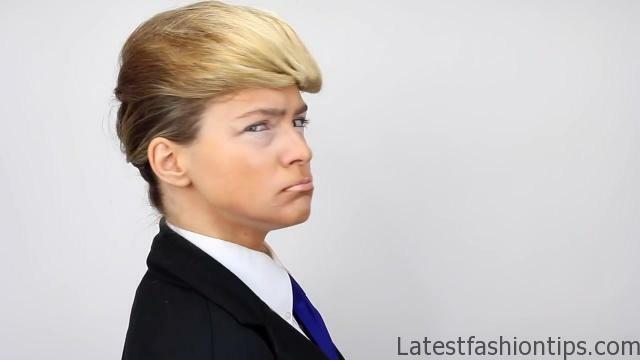 Like many Americans you may have looked at Donald Trump’s hair and wondered what how why and well I have to admit his hair is as confusing as his political campaign I can show you how to do it so if you want to dress up as Donald Trump here’s how clearly I’m starting out this tutorial in full Donald glam and my first step is to section the hair on top of my head so go from your temples to the crown brush all of that hair together and secure it an elastic at the back of that part then clip that ponytail on top of your head now take the rest of the hair and brush it into a ponytail just underneath the one we just made and finally you are going to create a Topsy tail by splitting the hair in half over the elastic and then pulling the hair up and through that hole that we have made pull that nice and tight and you are ready to move on now that top ponytail free and start to fluff it up by back combing with your brush this is going to get you a nice fluffy texture just like the souffle of hair that Trump likes to wear on top of his head bring that. 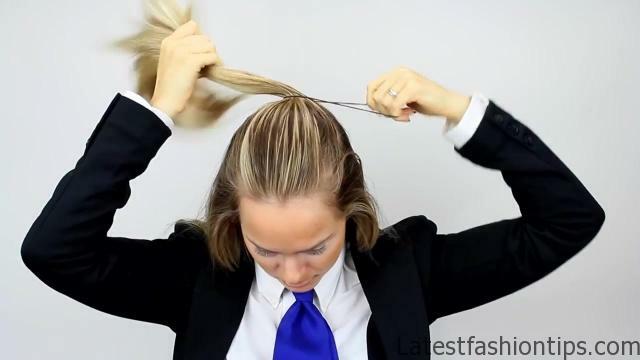 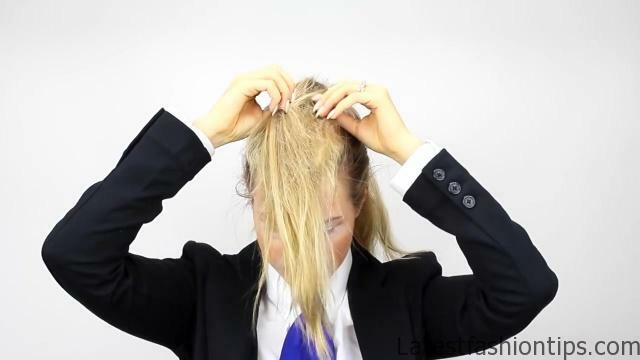 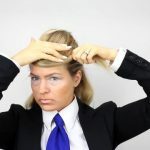 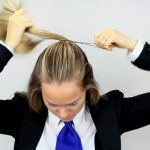 On top of your head and then stretch it out a little bit so that it fits right between your temples and that in place this is going to be our pin cushion for the rest of the hairstyle then sweep any extra hair you have over to the side and pin that in place as well and now you are just going to take care of that back ponytail you are going to back comb this one to net the hair together like a nice little ball of cotton and then you are going to pull that over the top of your head you want to arrange this over the pin cushion that we made and you want it to look as toupee like as possible go ahead and hold on to the bangs make sure that everything is arranged just the way you want it and then start pinning at the sides to hold everything in place once you have got the sides fanned also make sure to pin the top just in case it gets windy should also probably tell Donald Trump that he needs to know. 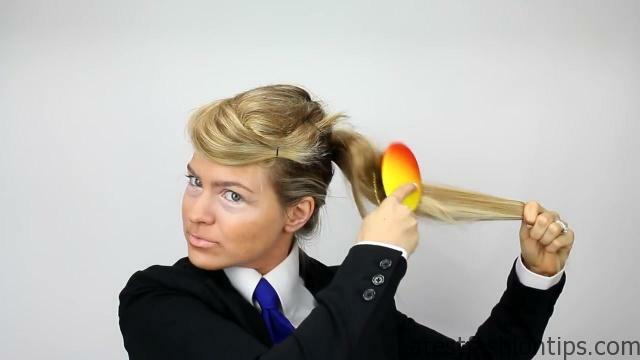 Now I’m going to take the hair and I’m going to flip it under and sweep it to the side just like so but to make it extra Trumpy I decided to go ahead and flip it under and then use my flat iron to get a nice little crimp there at the end be sure to move your fingers a safe distance back and then take your flat iron and just put it right there over where you folded your hair it will give you a nice little crimp then flip your hair under and over to the side and pin the excess either right underneath your toupee or over on the side of it you can finish off by taking a comb and just lightly going over the ends so that you get this nice kind of cotton candy texture on the ends of the hair finally douse your hair and hairspray and then be sure to slick the sides back and there it is the Trump and all its glory so fluffy so frizzy so lacking in self awareness I hope you guys have enjoyed this post this is just a fun little thing for me to put together and I hope it was a fun little post for you to watch I hope that you have a wonderful Halloween and enjoy a couple of the Halloween posts I have coming up I will see you guys on my next one mwah bye.